HELLO! HOW ARE YOU THEN?... ALRIGHT? "Believe everything and believe nothing...!" ...this was my approach throughout researching QUO's never ending touring history, which is to say that I believed every bit of information I ran across may have occurred, but doubted that it actually did happen....until I could prove it. Keeping this theory in mind, I sat down in May 2005 and began my research into Status Quo's concert history, talking with many people as possible to get the accurate story from those who were there first-hand. 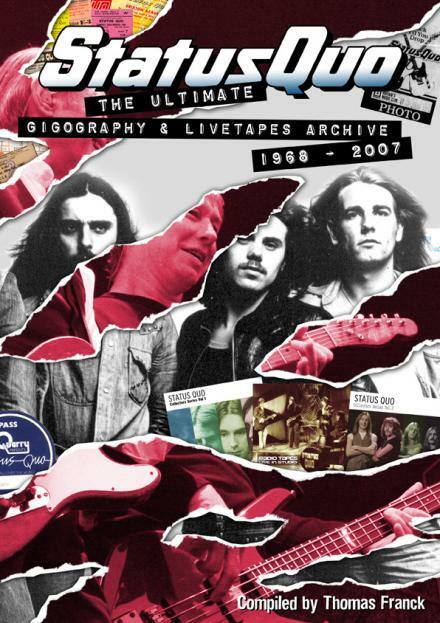 I spent hundreds of hours at online libraries, exchanged over 400 correspondences with QUO Fans from five different continents and accumulated in excess of 2000 pieces of paperwork relating to QUO's history. As you are about to see, much of QUO's early 70's touring history has remained unspoken, rewritten and even forgotten. Over the years, these factors have combined to create a history that is full of inaccuracies, inconsistencies, exaggerations, and even outright lies. Naturally, biographical works suffer when too much information is cannibalized from one source to another, or when "facts" are accepted at face value without much effort made to verify their accuracy. It's also natural to assume that historical information coming from the band, their crew and Management is accurate. But the truth is the guys in the band were far too busy living their lives to sit down and archive it properly. For these reasons, I went to as many first-hand sourses as possible in order to reconstruct STATUS QUO's concerts history with the utmost accuracy and having substantially corrected, reworked and extended all publicly available tour schedules. By the end of 2016, over 5000 shows had been performed since 1967 as (the) STATUS QUO. Pre-existing web- and print published attempts are, frankly rather poor with numerous errors and omissions, so I rapidly met my primary intention: with the assistance of "the worldwide QUO community", to provide the definitive listing, at the core of the ultimate Gigography. The next stage, which is far from complete, is to incorporate the Livetapes (Audience Recordings) themselves. I have a large number but it's hoped the "global Quo fan base" can fill in quite a few more gaps. Where a bootleg recording of a show is known to exist, the title is stated. (including some of the cover artworks made & send by other Fans). If your photo or artwork have been uploaded without your permission, please contact me and I'll be happy to take them down if you do not want them on the site or correct the credits if you do want them to stay. This archive is intended to provide anyone who is interested in STATUS QUO Live recordings and concerts with covers for these audience bootlegs and concerts. I do NOT sell these recordings. I do NOT distribute them, or help anyone to buy them. I am not encouraging anyone to buy them. Finally, i do NOT want this archive being used by or in conjunction with any commercial enterprise, whether for profit or otherwise. I want my position on these matters to be clear. DON'T PAY FOR QUO BOOTLEGS - ONLY TRADE THEM! This is emphatically NOT an endorsement of commerical bootlegging; the Ministry recommends trades, provided no money changes hands, and never as a substitute for official releases. The task of analyzing and reconciling this enormous archive of information was often very difficult and the results of my research frequently surprised me. In fact, there is a tremendous amount of information here which will directly conflict with what you may have read or saw before. Don't be dissuaded; I have thoroughly researched everything you're about to read. Included in this listing are festival appearances, benefit concerts, radio and television live sessions in front of an audience, major tours, and other significant concert performances. So, while the story told within may not mirror any history of STATUS QUO with which you are familiar, I think you'll find another story of QUO's touring history richer, more human, and perhaps even more inspiring than ever. Enjoy and keep on Quoin'. I'd love to hear from you, thanks!